Last week my family and enjoyed a memorable Alaskan cruise on the Disney Wonder. We boarded the ship in Vancouver and traveled through an area known as the Inside Passage. The weeklong cruise took us through the Tracy Arm Fjord to view Sawyer Glacier and included stops in Skagway, Juneau and Ketchikan. Below is a shot of the Sawyer Glacier in Tracy Arm. We didn’t get as close as I’d hoped. I overheard from one of the crew that the prior week they had gotten right up to the glacier, but this week an increase in ice chunks was preventing us from getting closer. This was taken at a pretty standard 26mm. I’m not sure he was correct, but I wasn’t desirous of having a close encounter with any icebergs and I was eager to try out my new zoom lens. This was taken at 75mm, so I didn’t even need to use the full range. Any closer and I would lose the surrounding peaks which provide much needed contrast and give context to the glacier. Unfortunately, it was cloudy and rainy for most of that day, so we didn’t get any nice blue skies, but it was still neat to see nonetheless. We invited the grandparents to join us which made for a nice big family trip. My parents had never been on a cruise and no one else but me had been to Alaska before (about 12 years ago for me). The ratio of 1 baby to 6 adults was also very favorable, allowing me and the hubs to have a bit of time to ourselves. It also allowed me some time alone to go on my photo excursions around the ship to capture the ever-changing landscape as we sailed along. My main gear includes a Nikon D90 DSLR plus two lenses: a Nikon 50mm f/1.8 prime lens (it’s a fixed focal length lens which means it doesn’t zoom) and a Tokina 11-16mm f/2.8 wide angle lens. I usually have my prime lens on my camera at all times and it is a very sharp lens that works well in low light, however, I knew that this type of trip would require a zoom lens. I did some research and ended up purchasing a Nikon 18-200mm zoom lens (AF-S DX Nikkor 18-200mm f/3.5-5.6 ED VR II) just days before leaving. I had contemplated the 18-300mm which would have given me more zoom, but it would have added both length and weight and I wanted to be as mobile as possible given that our little guy would surely keep us on our toes. I only brought along the 50mm prime and the 18-200 zoom lens. Although I’m sure I could have gotten some awesome shots with the Tokina – again I had to keep it light. Because the range wasn’t too different from that of my zoom, there was no need to basically duplicate the lenses. To show you how close the zoom lens could get, the first photo below was taken at 75mm focal length while the second was zoomed in at 200mm. I was pretty amazed at how clear the zoomed in photo turned out. I could see their faces very clearly and in fact I recognize some of them from our ship. All the gear served me well, except I didn’t really use the camera bag. I only ended up using it to transport my camera on the flight there and back. I didn’t change lenses so I just threw my cameras in my regular day bag. I know some may think that’s risky, but I figured the diapers would provide enough cushion! I brought my Lumix camera primarily as a back up. I would hate to lose my DSLR or have it break without a replacement in the wings so I typically bring two cameras on every trip and did so even before I had my DSLR. I also planned to use the Lumix for shooting HD video as well as for photos that may require flash. I don’t like using the flash on my DSLR as I find it too harsh and I haven’t mastered using it yet. The one thing I should have brought that I didn’t? Given all the video I shot, the 8GB SD card filled up by mid week. I ended up buying a 16GB SD on the ship and we all know those prices are inflated. I paid $30 for it when I could have bought one for half that, but oh well, memories are priceless right? You might also wonder why a tripod didn’t make the list. I could have brought one, but I also knew that I wouldn’t have the time or patience to set it up so I left that at home. I suppose another thing I should have carried was a lens cloth to wipe off the raindrops off the lens. The verdict on the 18-200mm zoom? It was perfect for this trip. I don’t feel I missed anything by not getting the 300mm. I was able to get in pretty close to capture some wildlife shots like these sea lions. The lens also worked well for family photos and various indoor shots as well including those taken with my camera’s built in flash. The only issue was when I was using flash and the zoom lens to take photos of things within a foot – the lens cast a shadow on the lower part of my photos, but just stepping back a bit took care of that. Well there you have it! Have you cruised Alaska before? Any tips to share? Tell me all about it! I’ve been looking into zoom/wider lens as well and I will definitely keep that AF-S DX Nikkor 18-200mm lens in mind. How do you like the Tokina lens btw? Also, you took some beautiful photos! Glad you liked it! I love the 18-200 Nikkor lens – I highly recommend it. It even takes good portraits as well.It does take some getting used to as it’s quite a lot heavier than the prime lens, but some situations you need zoom – like shooting wildlife for sure – situations where you can’t get any closer. The Tokina is great when you want to capture a room to give it a sense of dimension. It can work with portraits too but only if you’re going for a dramatic look, cause you’ll get distortion close up. thanks for the great photos! Maybe if we go next year I will get to share some photos too! You are an inspiration! It was definitely a beautiful cruise. Very picturesque – since you’re planning well in advance I’m sure you’ll be able to find a good deal! Good luck on the trip planning! We booked our trip when we return home to Japan at the end of May 2014!! So excited…checking pinterest and anything I can find on how to take photos on the trip and what to enjoy and even added one day excursion specifically for photo enthusiasts!! For this ‘hobbyist’, that’s a plus!! Thanks again for your tips! We will be doing the one week inside passage tour from Vancouver to Whittier, do the last land trip that ends in Anchorage and returning home from there!! It will make a wonderful 40th wedding anniversary get away!! I am looking forward to going on a similar Alaskan cruise in a week or so. Will be my first Alaskan cruise – although I have gone on several Caribbean cruises. I am wondering if I will be missing any photographic equipment. 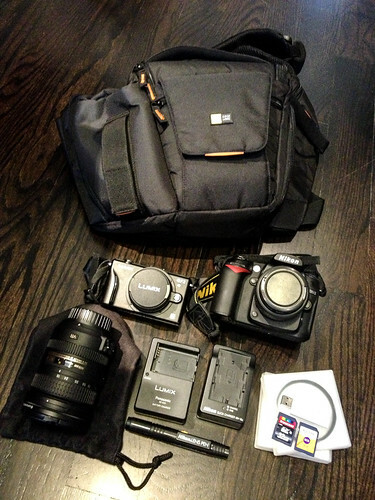 Plan to carry Nikon D7000, the 18-105 kit lens, a prime f2.8 180mm lens. The prime is sharp … but I am wondering if it would be worth buying the 55-200 f4.5 lens to avoid changing out the prime so often? Thoughts? Also, any general advice for the trip ? That’s a tough question. As I mention in my post, I don’t consider myself an expert on gear, but if I were in your shoes, I guess I would ask myself 1) how much do I want to carry; 2) will I actually use it? 3) will I have photo regrets if I don’t buy it? Love your photos! Great composition! Thank you for sharing. Great images and thanks for the post about your gear! I am going on a Royal Caribbean cruise to Alaska in about four weeks (Memorial Day week). I’ve been searching for articles about essential photo gear for the trip. I cannot wait for all the photo ops in a place with such natural beauty! Do you think I will need to take a flash? We are going on the Disney Dream. I think it’s good to have your flash just in case. Depending on the time of year that you’re going, Alaska can be rather gray which means the interiors of the ships don’t get too bright. So, if you’ll be taking some photos onboard, it’s nice to have it. Have a fun trip! We will be going on an “inside passage” cruise at the end of May/beginning of June, on the Grand Princess. Though we’ve been on a few Mexico cruises and a few Caribbean cruises, this will be our fir Alaska cruise. Camera is a Nikon D7100. Current lenses are 50mm f1.8D and a 105mm f2.5 AI-s. Thinking of getting a zoom lens for trip (and to use as a walk-around after that. Looking at 18-300, 18-200 or 18-140. Read that the “140” is the sharpest of the three. I have been told by one “expert” to get the 18-140 and a Tamron or Sigma 150-600, but that thing is a beast. Hi Mark, I’m not a gear expert so I would hesitate to give you a specific lens recommendation, but as you surmised, a zoom lens is pretty essential for an Alaskan cruise. You won’t get close to capturing the wildlife without one. I would say that you should think about what you will actually be willing to carry. What’s nice about an Alaskan cruise is that if you have a balcony, you can even stay in your room and shoot from there. I loved being able to do that. For me, size and weight was a huge consideration. At the time I had one little one and he came with all his “essential gear” like diapers and bottles haha, so I always have to balance my desire to have every tool at my disposal with the reality of traveling with a family. My Nikon zoom is only 1.2 lbs. The Sigma 150 – 600 that you mention is over 4 pounds. I have weak wrists – I’d have to go to the doctor after shooting a day with that lens! So as for the others, I would look at price too. Do you get much more for the extra power and extra bulk? I hope that helps. I would probably go for the 18-200 or the 18-140. Maybe you picked one already? Love to hear what you decided and hope you have a wonderful trip!